Ninja-K #5 has Colin and Ninja-C teaming up to take the Acclimation Bureau down once and for all. It opens up with them identifying the Royal Horseguards Hotel as the Bureau’s headquarters. They’ll able to infiltrate it relatively easily, although their methods aren’t entirely the same. K doesn’t want to kill anyone since he believes everyone doesn’t bear the same responsibility. However, C wants to kill everyone, and the only thing preventing him is K.
Everything’s a breeze until they run into a Zenith-Armor guard. A Zenith-Armor guard’s armor is virtually impenetrable and protects them from all manner of attacks. Also, if their vital signs are connected to explosives so if they’re killed everything around them is incinerated. So K keeps the guard occupied while C goes on ahead to retrieve the data they need. Can Ninja-K trust Ninja-C enough to retrieve the data without doing something reckless with it? Or is Ninja-K the one still in denial about the extent of the damage caused by the Acclimation Bureau? This riveting story arc took an interesting turn last issue. As shocking as the revelation of the existence of the Acclimation Bureau was, Colin was offered an alternative by Ninja-G. She wasn’t completely consumed by revenge like Ninja-C. She built a life relatively free from the lasting impact of the Bureau. So Colin’s mindset during the assault on the Bureau’s headquarters, as opposed to C’s, was reflective of what he wanted to maintain about himself. But this issue needed to address more than just Colin or C’s angst. This story arc raised serious questions that needed to be answered. And thankfully it did. Ninja-K’s fight with the Zenith-Armor guard was just the warm up. Interestingly enough, I saw this also as a metaphor for the Ninja program and its agents. They spend decades working to perfect a seemingly impenetrable armor so they can get the job done. But even still, a flaw remains. A flaw that Colin was aware of and knew how to exploit. The real battle was between K and C after they retrieved the data they were seeking. The fight was filled with the usual gadgets but Ninja-K’s fights always come off as entertaining with some unique aspect. And this one was no exception. It was a clash of ideology as much as skill. 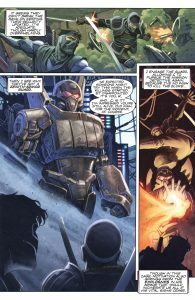 Last issue raised the question of Neville’s potential involvement in the unfortunate events in Colin’s life. Neville’s answers were solid because they didn’t feel like a cop-out. I dislike when story arcs start off with bold questions and then whiff on the answers so everything returns to the status quo. I won’t give away any spoilers about the outcome of this interaction but I was satisfied. The answers even explained the earlier infiltration of the Bureau’s headquarters. It takes a certain person to succeed in the Ninja program, and often a troubled past. With the conclusion of this issue maybe Colin can find a way to achieve a different outcome. 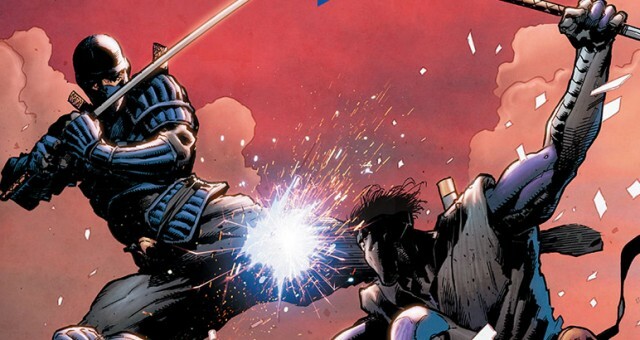 Ninja-K #5 is an enjoyable conclusion to the story arc and ties up the loose ends wonderfully. 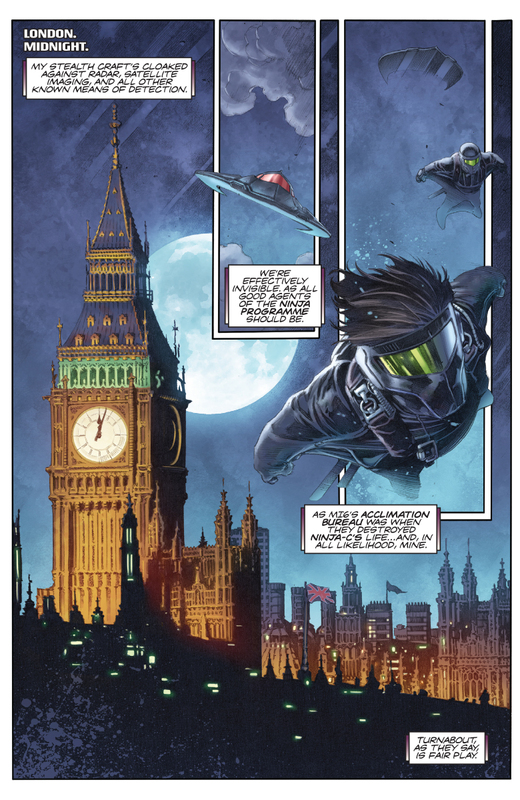 Colin and Ninja-C infiltrating the Acclimation Bureau’s headquarters was slightly easier than expected but that is explained as the story unfolds. This issue doesn’t shy away from confronting the differences between Colin and C’s stance on going after MI6, and it’s better as a result. The depth of these stories never cease to amaze me, and I’m glad this one ends on a solid note.